Unexpected guests? These easy and healthy appetizers and meals can be in on the table faster than pizza delivery. Surprise! Your in-laws just dropped by for an unexpected visit. Your first instinct is probably to run to the fridge and look for some food to put out, but the bag of baby carrots and the stale cookies in your pantry just won’t cut it. But have no fear — you don’t have to let your mother-in-law silently judge you for 30 minutes while you wait for the pizza delivery. With just a little bit of forethought, it’s easy to impress unexpected guests with a simple last-minute appetizer or meal. Stock up the pantry: If your inventory is looking a bit bare, add some items to your shopping list. Think about different courses, like appetizers, mains, drinks and desserts. Items like canned beans, jarred olives, artichokes and peppers, crackers, Chex mix, dry pasta, jarred sauce, seltzer and even baking mixes are lifesavers. Pro tip: order non-perishable items online from big box stores to save yourself a trip to the store. Shipping is usually free! Buy some frozen essentials: Having a well-stocked pantry will probably suffice, but it never hurts to keep some goodies in the freezer as well. If you’re cooking dinner one night and find yourself with some leftover chopped veggies, freeze them! Other helpful freezer staples are edamame, frozen brown rice or frozen appetizer bites. Now that you’re well prepared, it’s time to pull from your storage and create a killer dish in a flash. We tapped some registered dietitians for their go-to bites when last-minute guests stop by. Break out your food processor and impress you guests with a homemade hummus on the fly. “Hummus requires ingredients I almost always have, but it's also easily customizable,” says Chef Julie Andrews, MS, RDN, CD. “I use canned chickpeas or another bean, olive oil, garlic, tahini (you can skip if you don't have any), lemon, salt and pepper and serve it with crackers, pita or veggies,” she adds. If you don’t have these items in your pantry, now is the time to add them to your list. A pasta dinner is only minutes away, if you’ve got the right ingredients. “A super quick crowd-pleasing meal only requires ground turkey, a jar of marinara sauce and a box of pasta,” says Lauren Harris-Pincus, MS, RDN, author of “The Protein-Packed Breakfast Club” and founder of NutritionStarringYOU.com. Just brown the meat in a skillet, cook the pasta and then combine the two in a bowl with jarred sauce. “It feeds about six people in under 20 minutes,” says Harris-Pincus. If you’ve got a food processor, chocolate chips, dates and nuts, you’ve got a quick no-bake dessert. If you’re out of almonds, try walnuts or pecans. Don’t have chocolate chips? Use white chocolate or a candy bar you’ve got stashed in the drawer. This recipe is completely customizable based on the ingredients you have on hand. Romesco dip sounds and tastes more elegant than it actually is. “It's basically almonds (or any nuts you have on hand), roasted red peppers, olive oil, garlic, parsley, salt and pepper all zipped up in a food processor or blender,” says chef and Registered Dietitian Abbie Gellman, MS, RD. “For added plant-based protein to fill up your guests, include some white beans in the mix,” says Gellman. Guests show up at the most unexpected times. For breakfast or brunch guests, a simple frittata will hit the spot. Jessica Levinson, MS, RDN, CDN, New York-based culinary nutrition expert and author of 52-Week Meal Planner, suggests utilizing a fridge staple to whip up a baked egg dish. You can sub in any frozen veggies you may have to make this simple crowd-pleaser. Serve with salad greens, toasted bread slices and a pot of coffee (and pour yourself an extra cup). Making a holiday snack mix is as easy as raiding the pantry. “Grab a few crunchy things, one sweet thing and one salty thing,” says Sara Haas, RDN, LDN, culinary dietitian and author of Taco! Taco! Taco! and co-author Fertility Foods. “Toss it all together and serve in a festive bowl or dish — no cooking required,” Haas adds. 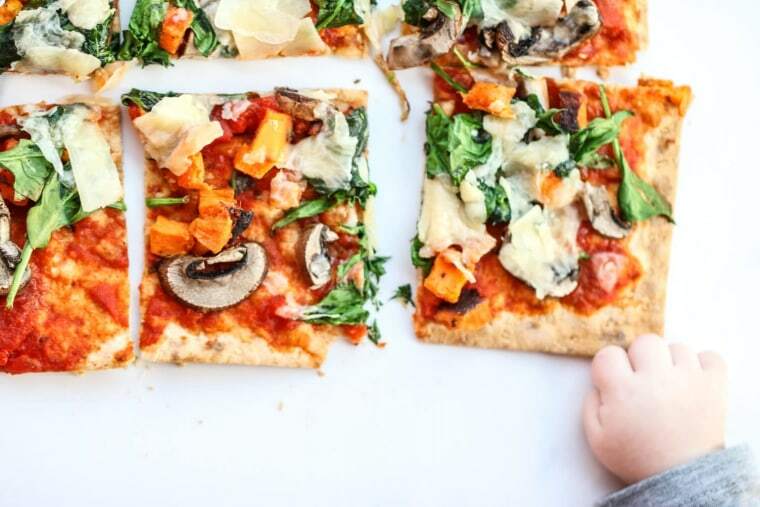 “I always keep some sort of flatbread in the freezer so I can pull it out and make a go-to pizza that everyone will enjoy,” says Elizabeth Shaw MS RDN CLT CPT, nutrition expert and owner of ShawSimpleSwaps.com. She suggests adding any sauce you find in the cupboard. “If you don’t have pizza sauce, you can use BBQ sauce or another condiment and top it with cheese, veggies or basically anything you can find in the fridge or pantry,” says Shaw. “I always have at least one block of cheese in my fridge (I stock up when it’s on sale),” says Jenna Braddock, MSH, CSSD, RD Dietitian and food blogger at MakeHealthyEasy.com. “From there, I add whatever crackers or bread I have around, lay out any fresh fruit from my fridge, and finish it off with a dried fruit or nuts.” The best part of this is that you can customize the type of cheese, fruit and nuts to suit your taste (or based on what you’re able to scrounge up). And might we add this is the perfect time to break out that fancy serving dish your in-laws bought you that's been collecting dust in the cabinet? While you're at it, kick your drink game up a notch, too. Wine is always a winner, but why not think outside of the bottle this year with a fruity spritzer? Just combine 3 ounces of your favorite wine with 1 ounce of seltzer and 1 ounce of 100% fruit juice, and garnish with fresh fruit slices, if you have them. Your guests will be impressed and feel special — like you were planning for their arrival all along.